When you hear the word “soy”, you probably think of soy sauce immediately. But have you heard of soy milk and all the benefits of soy milk? This milk is derived from soybeans and it can be a useful alternative to regular milk, especially if you experience allergies to the lactose present in the latter. In recent years, the benefits of soy milk have surpassed those of regular milk. But is soy milk really that much better than cow’s milk? 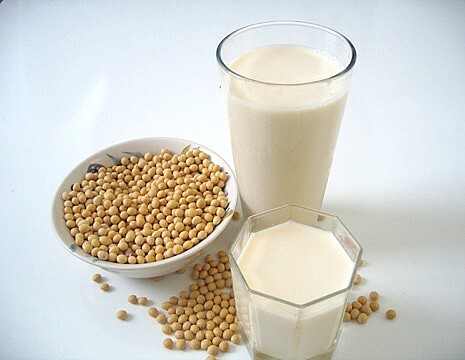 Soy milk is made from whole soybeans or soy flour. It forms the basis of many vegetarian and vegan diets. The American Academy of Pediatrics recommends the use of soybean milk for infants who cannot tolerate cow’s milk or breast milk. Lactose-intolerant individuals can easily enjoy the benefits of soy milk as it is lactose free. Soy milk has the same amount of protein as regular milk, but it differs in its amino acid profiles, fat and cholesterol levels, and digestible calcium. Soy milk has lower fat content. As a result, it is good at minimizing the levels of saturated fat. One cup of soy milk has 5 grams of fat and no cholesterol, whereas one cup of cow’s milk has 5.1 grams of saturated fat and 33 mg of cholesterol. Therefore drinking soy milk will likely reduce your chance of developing heart disease in the long run. Soy milk has no cholesterol and its protein component lowers LDL (bad cholesterol) levels, which in turn promotes a healthy heart. The American Food and Drug Administration recommends consuming 25 grams of soy per day, in order to experience the cholesterol-lowering properties of soy. Many individuals have difficulties digesting milk, as they’re allergic to the lactose component found in cow’s milk. This is a serious condition because it inhibits the absorption of calcium. According to a study conducted by the University of Georgia, lactose-intolerance rates are highest among Asian Americans, followed by African Americans. To counter this issue, a fortified version of soy milk has been introduced in the market. It contains added calcium and vitamins A and D, to help fill the nutritional gaps caused by lactose intolerance. Drinking soy milk is known to prevent breast cancer. In Asian countries, where soy consumption is high, the prevalence of breast cancer is much lower as compared to the other rest of world. Consuming soy before turning menopausal provides protection against developing breast cancer. Isoflavones are the most prevalent type of antioxidant in soy milk They reduce the effects of aging, ease the symptoms of menopause, prevent osteoporosis, and reduce the risk of reproductive cancers. Soy milk is no longer a bland, odd smelling concoction. It is available in a variety of flavors. After reading about the benefits of soy milk, if you’re planning to switch to this variety of milk, ensure that you select its fortified version, as it’s high in calcium. Go on, have a glass of soy milk right away! This entry was posted in Nutrition and tagged health benefits of soy milk, soy milk benefits by Zipheal Editorial Staff. Bookmark the permalink.